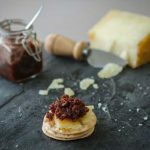 French Onion Bites with Port Onion Jam from Pedroncelli Winery | What Goes with What? Heat a large skillet over medium heat and add olive oil and butter. Then add onions and cook (stirring occasionally) until the onions are soft and translucent. Add the garlic, thyme and savory mixing well. 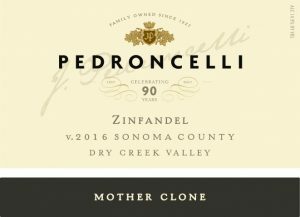 Stir in the Pedroncelli Four Grapes Port, reduce heat to low and let simmer. Reduce down to a “jammy” state. Preheat the oven to 375F and put a rack in the center. Slice the baguette into ¼” slices and spread out on a cookie sheet. Put in the oven and cook until they just turn a light golden brown (about 6-7 minutes). Remove when done. Place a schmere of the Port and Onion Jam on each toast and top with Asiago shreds. Lower the oven to 300F and put the crostini in the oven just until the cheese melts. Remove from the oven and place on a serving tray for your guests.